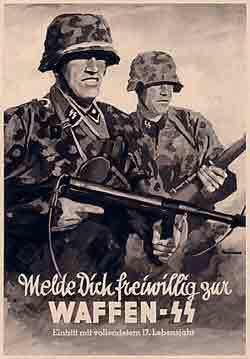 The Waffen-SS ("Armed Protective Squadron") was the combat arm of the Schutzstaffel. Commanded by Heinrich Himmler who was ranked Reichsführer-SS (National Leader of the SS), the Waffen-SS saw action throughout the Second World War. After humble beginnings as a protection unit for the NSDAP leadership, the Waffen-SS eventually grew into a huge force of thirty-eight combat divisions comprising over 950,000 men. In the Nuremberg Trials, the Waffen-SS was condemned as part of a criminal organisation, and therefore Waffen-SS veterans were denied many of the rights afforded other German combat veterans. However the Nuremberg Trials exempted conscripts from that comdemnation. The original cadre of the Waffen-SS came from the Freikorps and the Reichswehr along with various right-wing paramilitary formations. Formed at the instigation of Heinrich Himmler, the Leibstandarte SS Adolf Hitler was the first formation of what was to become the Waffen-SS. When the SA was rendered powerless in the Night of the Long Knives, many ex-SA men requested transfer to the SS, swelling its ranks and resulting in the formation of several new units including the SS-Verfügungstruppe (to become the SS Division Das Reich) and the SS-Totenkopfverbände (to become the SS Division Totenkopf and also the concentration camp guard unit). Waffen-SS men were equipped with camouflage smocks and helmet covers, a new innovation which made them easily identifiable and provided them with an edge in combat. While they received the latest in uniforms, the majority of the Waffen-SS men received second rate weapons and equipment, many formations receiving Czech and Austrian weapons and equipment. This policy continued throughout the war. Contrary to popular belief, the Waffen-SS did not receive the best equipment, and in fact many units were equipped with outdated or captured weapons, vehicles and tanks, with the majority of the best equipment going to the Heer's elite divisions (Panzergrenadier-Division Großdeutschland and Panzer-Lehr-Division) and the Luftwaffe's Hermann Göring Division. As the outbreak of war neared, Himmler ordered the formation of several combat formations from the SS-Standartes (units of regimental size). The resulting three formations (the LSSAH, SS-VT and SS-TV) took place in the Invasion of Poland as well as Fall Gelb. During the campaign in the West, both the Totenkopf and LSSAH were implicated in atrocities. The overall performance of the Waffen-SS had been mediocre during these campaigns. The poor initial performance of the Waffen-SS units was mainly due to the emphasis on political indoctrination rather than proper military training before the war. This was largely due to the shortage of experienced NCOs, who preferred to stay with the regular army. Despite this, the experience gained from the Polish, French and Balkan campaigns and the peculiarly egalitarian form of training soon turned Waffen-SS units into elite formations. On several occasions, the Waffen-SS was criticised by Heer commanders for their reckless disregard for casualties while taking or holding objectives. However, the Waffen-SS divisions eventually proved themselves to a skeptical Heer as capable soldiers, although there were exceptions such as Kampfgruppe Nord's rout from the the town of Salla during its first engagement in Karelia. The Waffen-SS truly proved their worth during the Third Battle of Kharkov, where the II.SS-Panzerkorps under SS-Brigadeführer Paul Hausser recaptured the city and blunted the Soviet offensive, saving the forces of Erich von Manstein's Army Group South from being cut off and destroyed. In Mid 1943, the II.SS-Panzerkorps took part in Operation Citadel and the LSSAH, Das Reich and Totenkopf (all now Panzergrenadier divisions) took part in the immense armour battles near Prokhorovka on the southern flank of the Kursk salient. These divisions are referred to as the classic Waffen-SS divisions, and they include the LSSAH, Das Reich, Totenkopf, the multi-national Wiking, the Hohenstaufen and Frundsberg, and the Hitlerjugend. While several other formations (e.g. the Nordland and Nord divisions) could also be considered elite, they are generally not referred to as classic SS Divisions. Himmler, wishing to expand the Waffen-SS, advocated the idea of SS controlled foreign legions. The Reichsführer, with his penchant for medieval lore, envisioned a united european 'crusade', fighting to save old Europe from the 'Godless bolshevik hordes'. While volunteers from regions which and been declared Aryan were approved almost instantly, Himmler eagerly pressed for the creation of more and more foreign units. In late 1940, the creation of a multinational SS division, the Wiking, was authorised. Command of the division was given to SS-Brigadeführer Felix Steiner. Steiner immersed himself in the organisation of the volunteer division, soon becoming a strong advocate for an increased number of foreign units. The Wiking was committed to combat several days after the launch of Operation Barbarossa, proving itself an impressive fighting unit. All non-germanic officers and men in these units had their rank prefix changed from SS to Waffen (e.g. a Latvian Hauptscharführer would be referred to as a Waffen-Hauptscharführer rather than SS-Hauptscharführer). An example of a division der SS is the Estonian 20.Waffen-Grenadier-Division der SS (estnische Nr.1). The combat ability of the divisions der SS varied greatly, with the Latvian, French and Estonian formations perfoming exceptionally and the Croatian and Albanian units perfoming poorly. While many adventurers and idealists joined the SS as part of the fight against communism, many of the later recruits joined or were conscripted for different reasons. For example, Dutchmen who joined the 34.SS-Freiwilligen-Grenadier-Division Landstorm Nederland were granted exemption from forced labour and provided with food, pay and accomodation. Recruits who joined for such reasons rarely proved good soldiers, and several units composed of such volunteers were involved in atrocities. Towards the end of 1943, it became apparent that numbers of volunteer recruits were inadequate to meet the needs of the German military, so conscription was introduced. The Estonian 20.Waffen-Grenadier-Division der SS (estnische Nr.1) is an example of such a conscript formation, which proved to be outstanding soldiers with an unblemished record. Not satisfied with the growing number of volunteer formations, Himmler sought to gain control of all volunteer forces serving alongside Germany. This put the SS at odds with the Heer, as several volunteer units had been placed under Heer control (e.g. all Spanish volunteers of the Spanish Blue Division fell under Heer control). Despite this, Himmler constantly campaigned to have all foreign volunteers fall under the SS banner. In several cases, like the ROA and the 5.SS-Freiwilligen-Sturmbrigade Wallonien he was successful, and by the last year of the war, most foreign volunteers units did fall under SS command. Waffen-SS soldiers of the Kaminski Brigade during the Warsaw Ghetto Uprising. Many other Waffen-SS volunteers, including many Wiking veterans, avoided punishment by joining the French Foreign Legion, and many ex-SS men fought and died at the Battle of Dien Bien Phu in 1954. Wallon volunteer leader Leon Degrelle escaped to Spain, where, despite being sentenced to death in absentia by the Belgian authorities, he lived in comfortable exile until his death in 1994. John Amery, the leader of the Britisches Freikorps, was tried and convicted of treason by the British government. He was executed in December 1945. Several formations within the Waffen-SS were proven to have committed numerous war crimes, most notoriously at Oradour-sur-Glane, Marzabotto and in the Malmedy massacre. Some additional allegations have never been substantiated as many were intended to link the Waffen-SS to crimes committed by the Allgemeine-SS (political SS). Perhaps the most infamous of all SS formations were the Dirlewanger and Kaminski Brigades (later to become the 36.Waffen-Grenadier-Division der SS and 29.Waffen-Grenadier-Division der SS (russische Nr.1) respectively. These formations, composed mostly of ex-Einsatzgruppen, released criminals and Russian Prisoners of War and commanded by the fanatical Nazis Oskar Dirlewanger and Bronislaw Kaminski, were engaged in numerous atrocities throughout their existence. 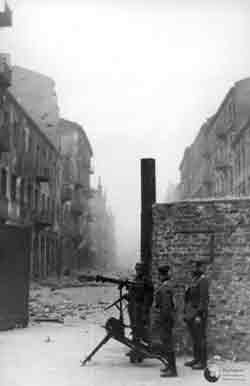 After their actions in putting down the Warsaw Uprising, Heer complaints resulted in these units being dissolved and several members (including Kaminski) being tried and executed for their role in several incidents. Similarly, the Waffen-Sturm-Brigade RONA has a "combat" record riddled with atrocities as well as abysmal conduct when faced with front line service.